This year, I'm starting a new competition for Python web developers called the WSGI War. I've been running the Django Dash for seven years now & have been frequently told that people wish there were something similar for the broader community. Well, now there is. The format is a 48-hour programming contest that happens 100% online (though you're free to meet with others in person). You may use any Python web framework (though it should really speak WSGI). You can have a team of up to three people, though team size doesn't affect judging & 1-2 person teams have done very well in the past. The full rules can be seen at http://wsgiwar.com/2013/rules/. It's a chance to challenge yourself, push your skills & see what you can really do under a time crunch. 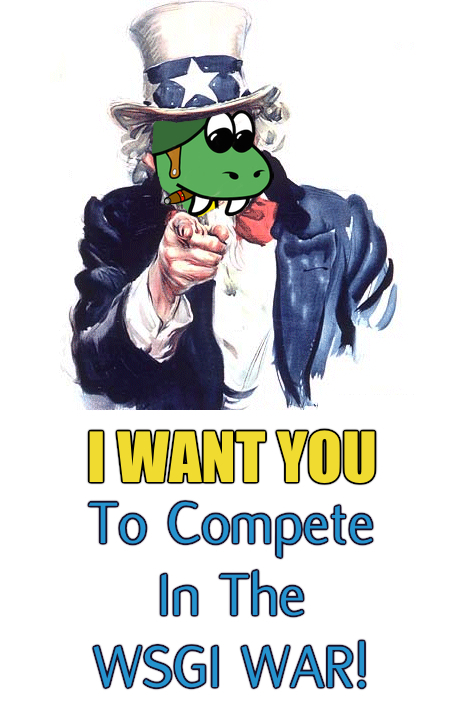 People have loved competing in the Dash in previous years, so hopefully the rest of the Python web community will too. Importantly, registration for the War will be opening in less than two weeks (September 14)! Registration is open just for ONE WEEK (closing on September 21) then the competition happens one week later (September 28-29). Finally, I'm looking for sponsors. Sponsoring is prize-based & just involves committing to providing a prize (or prizes) to a winning team. If you have a service or a product, those make great prizes (& publicity) as well! The prizes don't have to be big (some of the best loved ones are Amazon gift cards or shirts) and can be whatever you're comfortable offering. If you or your company would like to sponsor some prizes, please email me - daniel AT toastdriven DOT com. By on September 4, 2013.